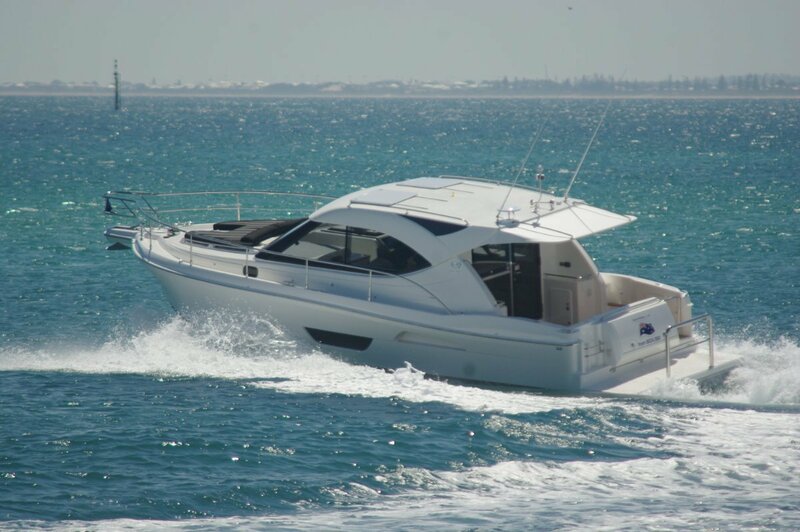 WA is the spiritual home of the fly bridge cruiser, with the sport yacht concept a comparative rarity; yet the latter has at least two advantages going for it. The social area is all on the same level, so there is no barrier between the driver and any of the guests, and you have a better chance of passing under bridges. 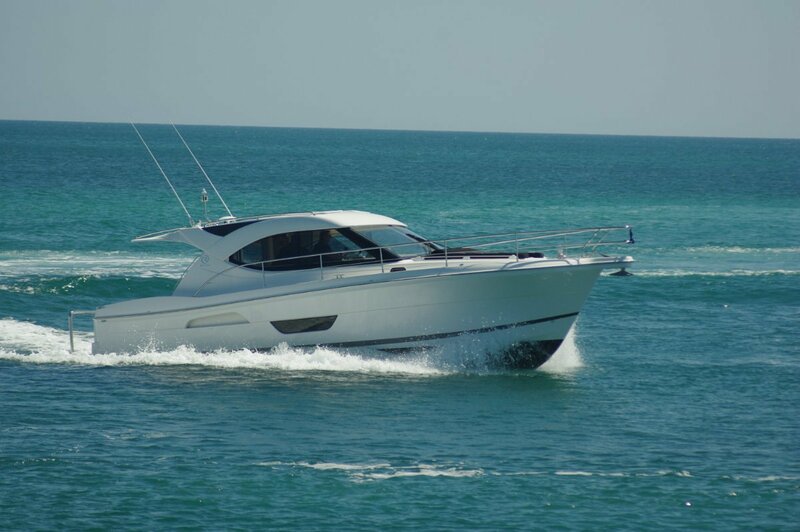 The Riviera 3600 does sport yacht very well. Riviera’s standard propulsion package uses the Volvo IPS system. When this was introduced there were a lot of (uninformed) doubts about all that mechanical complexity under the water. They have all disappeared now. IPS makes dummies look like manoeuvring genii, and it is far more efficient than shaft drive. Our boat has IPS 450s: in Volvo’s opinion they are equivalent to 450hp shaft drives although the attached motors are only 330hp. Volvo is confident enough in the system to give a five year warranty on IPS and motors. On the subject of warranties, the air conditioning gets six years and everything else on board two years. A huge extra benefit of IPS is that by removing gearboxes and shafts from the drive train so much internal volume is freed up. This is what allows comfortable accommodation for five. The double and triple cabins leave enough lower deck space for a bathroom that would seem generous in a much larger vessel. There was a time when a 36-footer had a cover for the toilet roll, to keep the shower water off it. 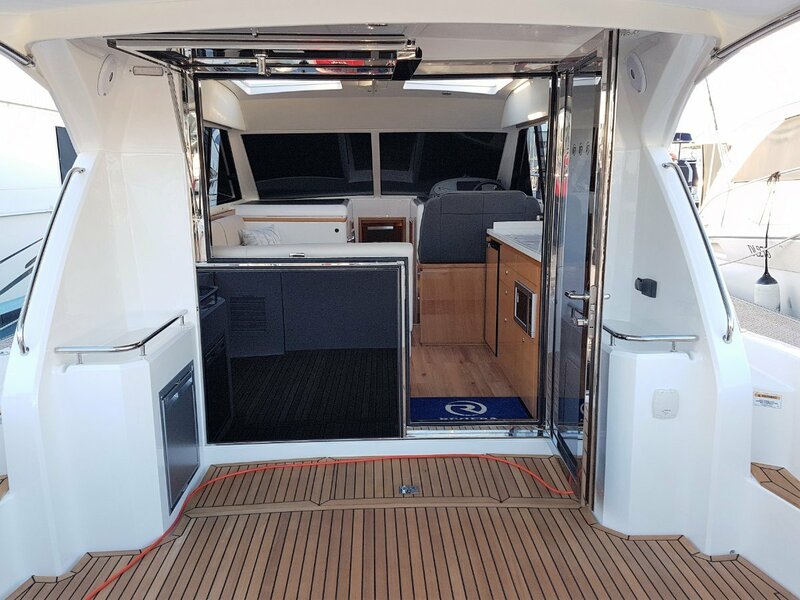 This boat has separate compartments for toilet and shower and both are spacious. The first class double cabin is right forward with good access to the bed from both sides and a skylight overhead. There is vast stowage and hanging volume in here, the wardrobe lined with cedar for clothes-eating pest deterrence, the bed pivoting up on gas lifts to reveal cavernous space. The double bed component of the other cabin is beneath the saloon deck so offers sitting room only, in the common after cabin style. 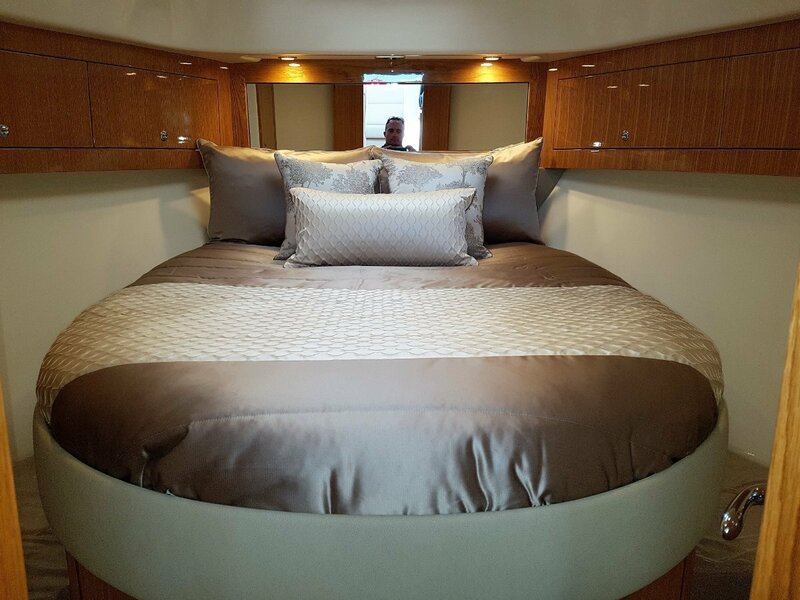 The cabin entry, containing the single bed and wardrobe, has full headroom and ample deck area for dressing. 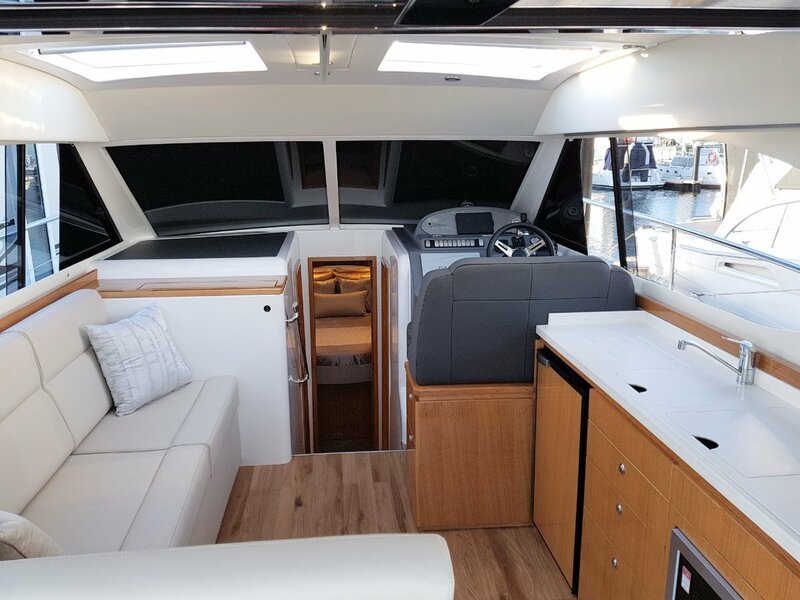 The saloon features Riviera’s knack of maximum value out of the available space, and also the superb finish the factory gives to timber; in this case gloss oak. To port is an L-shaped lounge that accepts a table at mealtimes. At its forward end is a retractable TV. To starboard is a double driver’s seat; aft of it the longitudinal galley. Fridge, microwave, hotplate and sink are present, as well as general and specialised dry storage (such as for wine and glasses). This is a light and airy compartment with large sliding side glass area, a pair of skylights and a disappearing rear end. This is achieved by a large glass door and a retracting window above the lounge’s after end. An invaluable piece of hardware in here is a fore and aft overhead grab rail. The cockpit provides an alternative, and more likely to be used, cooking and dining area provided with another fridge, an electric barbecue and a demountable table. Almost the entire deck gas lifts up to expose the engine space. Pre voyage checks are more likely to be done with access this easy, and servicing should need less time. The key item in front of the driver, apart from the wheel, is the large Garmin touch screen. Besides the usual plotter and sounder practically everything electronic on board can be controlled via this: radio, media, TV, movies, DVD and so on. The key item to the side is the IPS joystick. At manoeuvring speeds this is the item that makes everybody an expert. We gave it the task of taking us stern first into the pen at Mandurah’s Oyster Bar. It completed the job in about a quarter of the time it would have taken with shaft drive. The 3600 is good for 35 knots but, really, who cares? We spent most of the review day at eight knots or so and it felt great. But for those who do care, the Riviera will happily cruise at 26 knots burning 95 litres per hour or 3.7 litres per mile; which is pretty economical. At eight knots, though, that drops to a lovable 0.78 per mile.